Apple investigators claiming to be San Francisco police officers may have interrogated a man who was at the bar Cava 22 in late July, attempting to recover a lost iPhone prototype, reports SF Weekly. The publication spoke to the man, Sergio Calderón, who thinks that his home is the one referred to in the original story about a supposed lost iPhone. They said that they had traced the lost iPhone to his home using GPS. The group, which consisted of two men and four women, never identified themselves as employees of Apple or say that they were in the hunt for an iPhone prototype. Anxious to cooperate, Calderón said, he let them search his car and house. He also gave them access to his computer, to see whether he had linked the phone to his hard drive or had information about it in his files. Failing to find the phone anywhere, he said one of the “officers” offered him $300 if he would return it. As the visitors left, one of them — a man named “Tony” — gave Calderón his phone number and asked him to call if he had further information about the lost phone. Calderón shared the man’s phone number with SF Weekly. When the publication called the number, it was answered by an Anthony Colon, who told them that he is an employee of Apple but refused to say any more. 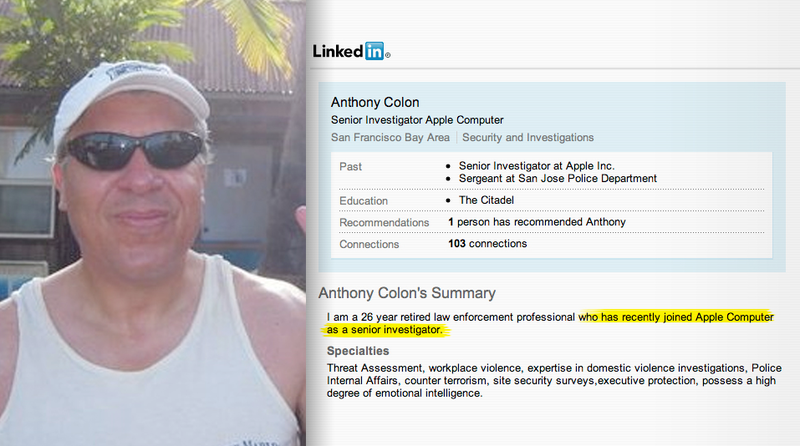 There was a public profile on LinkedIn for Colon, which listed him as a former San Jose Police sergeant who is currently employed as a “senior investigator” at Apple. That profile has since been deleted. According to Cnet, the phone apparently turned up on Craigslist, where it may have been sold for about $200. No details about the device are available either. The SF police have told SF Weekly that they will investigate the matter. Calderón just wants to know what happened and who the people were that he let into his home.